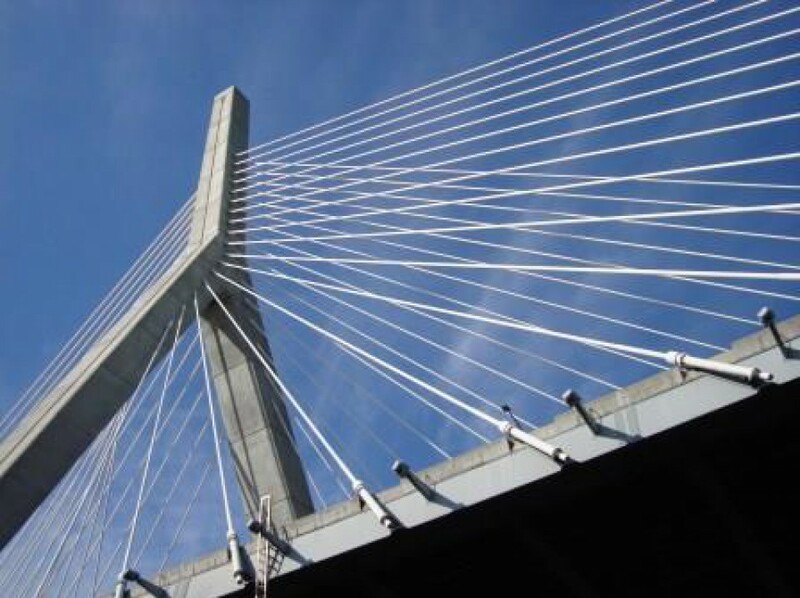 The Leonard Zakim Bunker Hill Memorial Bridge can be seen from many angles but this one was taken by me while on our boat underneath (!) the bridge. The bridge serves as the northern connection from and to Boston and is one of the widest cable-stayed bridges in the world. During the summer we take the boat down the Charles River (love that dirty water) past the Harvard Yacht club, Boston College, the Hatch Shell, the Boston Museum of Science and finally through the locks which lead into the Boston Harbor. It is a lovely ride and beautiful view. If you ever come to Boston be sure to take a Duck Tour so that you can experience the Charles River and see the Boston outline with a completely different twist. This entry was posted in Observations and tagged boating, Boston, history, musings, Photography, Zakim Bridge by simplygiselle. Bookmark the permalink. I love the lines against the blue sky. Such a lovely bridge! It’s brilliant to be able to see it from that angle. Thank you. The photo perspective is awesome. Great pic 🙂 .